Around 1967, the Ovation guitar company in the US wished to introduce a line of semi-acoustic guitars and bass guitars in order to broaden the scope of their existing catalogue. 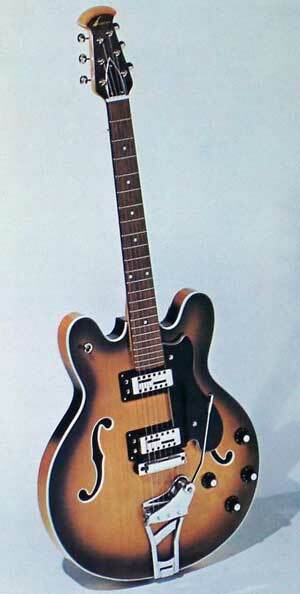 This was presumably considered to be a radical change from their acoustic guitar range, so rather than revise their production lines to accommodate such a different method of construction, they simply made an arrangement with Hofner in Germany to supply them with guitar bodies which Ovation could then finish and assemble with their own distinctive bolt-on necks in the US. The hardware for these guitars was purchased also from another German company - Schaller. At that time, Hofner were suffering sales lost to Japanese and US competition, and so one can imagine that they were very happy to enter into such an arrangement. They had been supplying bodies and neck to the US Carvin Company since 1964, and so were quite used to shipping these items across the Atlantic for other companies to put their names onto. In July 1968, Ovation introduced its first electric guitars, the Thunderhead and the Tornado models. Both these guitars were fitted with new-design bodies that a year or so later, Hofner would adopt for their new 4572 Model (and even also supply to Carvin!). These had been drilled for the electric controls by Hofner, and also some may have even been spray-finished prior to shipping. These two models were very soon followed by a 12-string version called the Hurricane, and then by a hollow-bodied bass called the Typhoon. These models were collectively called the "Storm" range. At a later stage, a version of the Thunderhead/Tornado models was introduced called the Eclipse. This was fitted with Schaller's version of the Hofner 513 "Blade" pickup. Initially, the bass Typhoon model used a different body to that supplied for the 6 and 12-string guitars, as can be seen above. Unlike the 6 and 12-string bodies, this was not used on any previous or later Hofner guitar, but does seem to have been an adaptation of the 4574/Verithin body shape with its more subdued cutaway curves, but with a narrower body-width. After a couple of years, Ovation reverted to using the same body as the 6 & 12-string guitars for the Typhoon Bass. This left Hofner is a situation whereby they were holding a stock of the Typhoon first version bodies. Since then, some of these surplus bodies have found their way into various independent luthiers' and Hofner enthusiasts' hands, and have been put together with other old Hofner parts into new instruments. Some fine instruments have therefore finally arisen from the ashes of the old Hofner/Ovation relationship. However, if Hofner logos are also put onto such guitars, there could well be problems in the future relating to identification of these "parts" guitars, with consequential dispute. Ovation finally discontinued their "Storm" Range in 1972. NOTE: The above is only a very brief history of the Ovation Storm range, as the intention of this Fact File is only to make readers aware of Hofner's own connection to the Storm guitars. For further information, it is suggested that websites which are dedicated to that guitar maker are consulted, such as the OVATION TRIBUTE site.